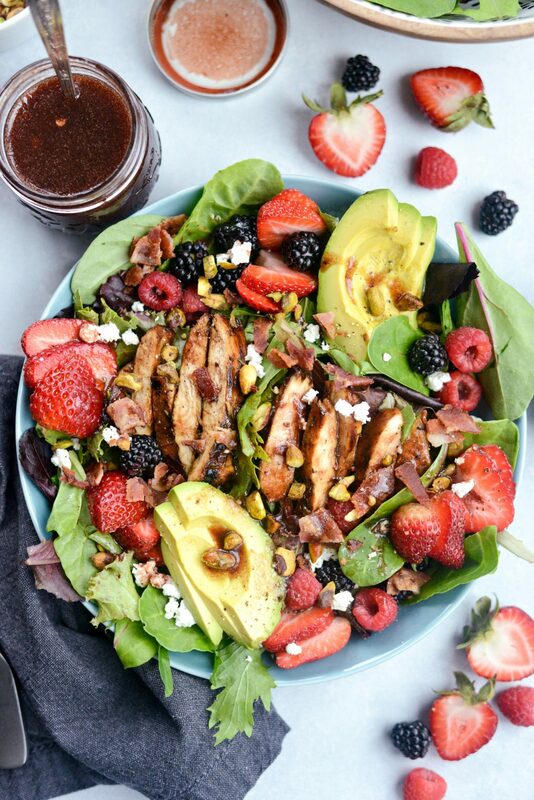 What has bacon, three kinds of berries and a fresh raspberry balsamic vinaigrette? 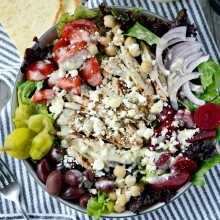 This berry spring salad! 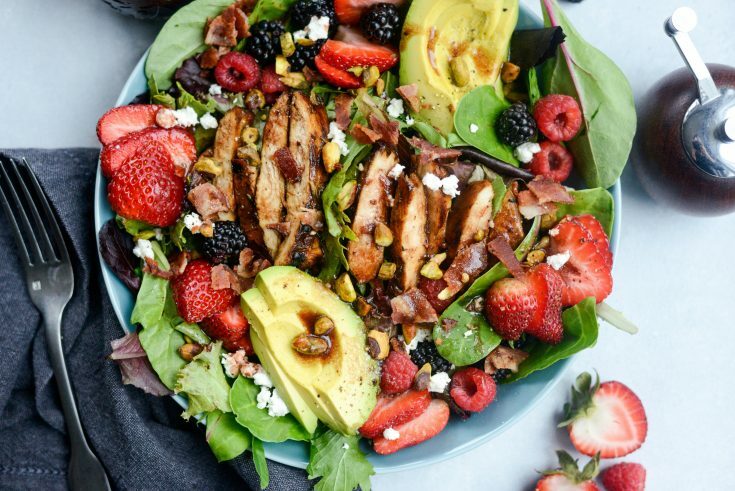 A mix of spring greens is topped with crispy bacon, sliced avocados, fresh strawberries, raspberries and blackberries, goat cheese, pistachios and the most amazing raspberry balsamic vinaigrette! I also added sliced balsamic rosemary grilled chicken to it — superb! I don’t always go to Whole Foods, but when I do I make it a worthy trip. The closest Whole Foods is about 50 minutes from where I live, so I only go every once and a while. But once I’m there, I like to walk up and down every isle and make several rounds in the produce so I don’t miss out on a single thing. 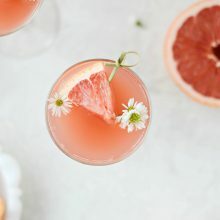 Last week, I ventured out right after I dropped Mal off at school, after my aimlessly meandering I left with a few bags filled with mostly fresh produce and a few other odds and ends. Why is it so hard to not want to buy pretty much everything in that store. I may not need it, but I want it. Whole Foods may be worse than Target. I have always tried to buy fresh organic fruits and veggies. It wasn’t always in my budget, especially in my twenties, but I do notice a difference in organic verse non-organic produce. Especially when it comes to fresh berries. Strawberries are more vibrant all the way through to their center and berries like raspberries or blackberries are smaller and sweeter and not so giant – which I prefer. As you may already know, I’m a longtime supporter of Fair Trade products and so I was pleasantly surprised to learn Whole Foods carries organic Fair Trade USA certified berries! I buy berries all the time and am thrilled to know that I can now give back even more whenever I buy fresh strawberries, blueberries, blackberries or raspberries. 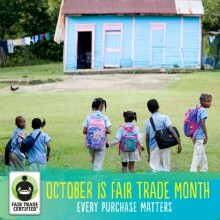 Every single Fair Trade purchase matters, big or small. You have the comfort in knowing you’re purchasing quality goods, but you are also supporting the farmer and community surrounding them. Buying Fair Trade items is truly a gift that keeps on giving. So to incorporate all these beautiful organic and Fair Trade berries, I decided to make a  berry good salad. 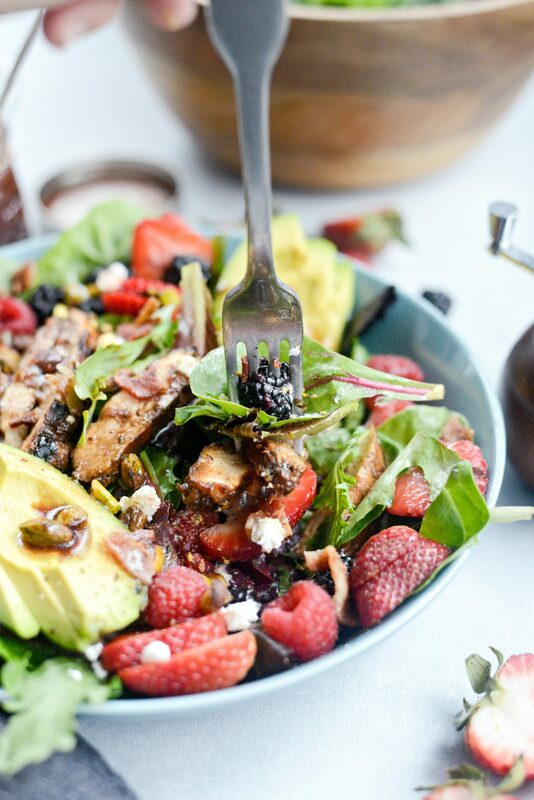 Fresh spring greens topped with alltheberries!! Then there is fresh avocado, goat cheese and pistachios with a fresh raspberry balsamic vinaigrette using fresh raspberries! 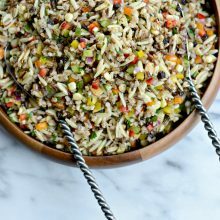 I have zero doubt you will love everything about this salad. This salad is everything. 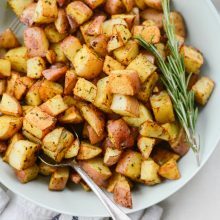 It’s the perfect light lunch or main course salad and is just bursting with flavor. 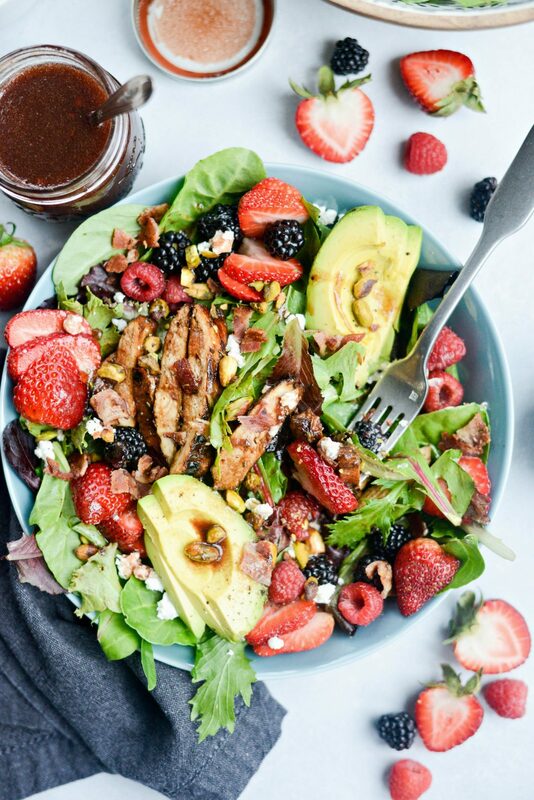 Here’s what you’ll need: Spring greens a 5 ounce package will serve 4 just fine, fresh (organic Fair Trade if you can) strawberries, raspberries and blackberries, strips of cooked and crispy bacon, goat cheese, avocado, chopped pistachios and raspberry balsamic vinaigrette. I also had just made this rosemary balsamic grilled chicken so I added slices of that too as well, which only added to the level of flavor and gave it a protein boost. SO good! 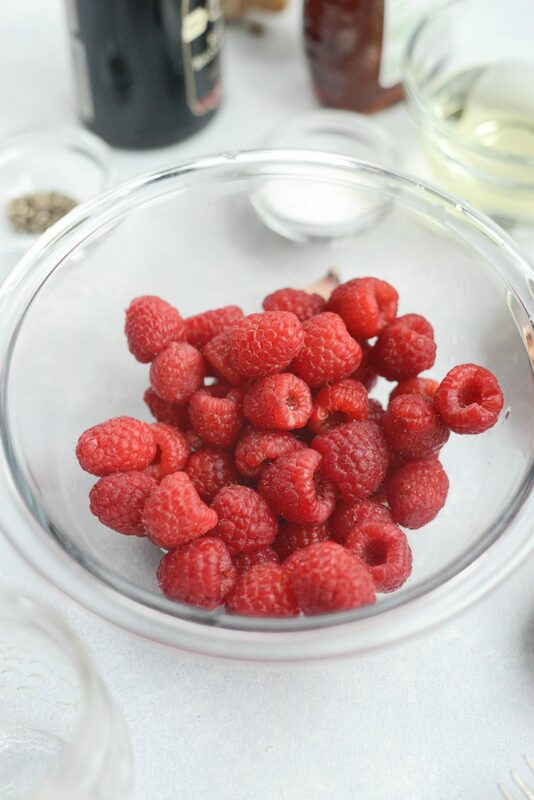 Rinse and place 1 (6 ounce) package of raspberries into a medium bowl along with 1 tablespoon granulated sugar. Use a fork to combine while smashing the berries. Set this off to the side for a moment. 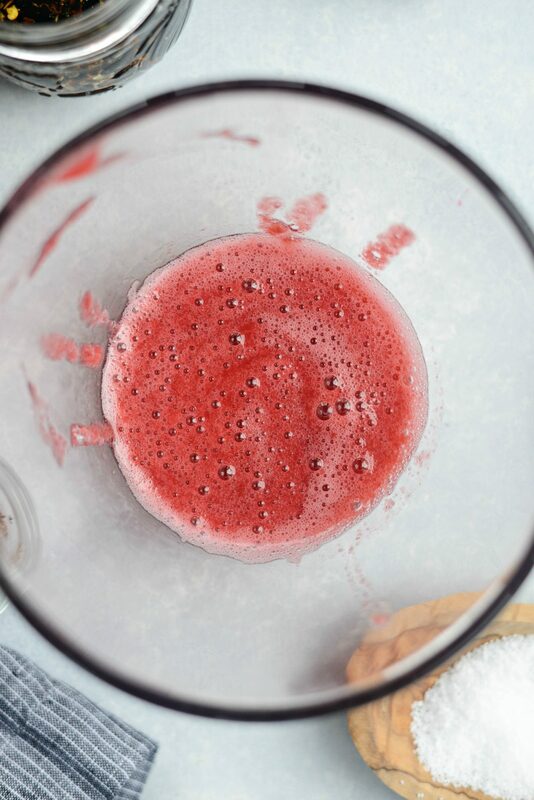 This gives the sugar time to work it’s magic bringing the natural juices out of the berries. Meanwhile, measure and add in the clove of grated fresh garlic, 1/2 teaspoon kosher salt, 1/4 teaspoon of freshly ground black pepper. 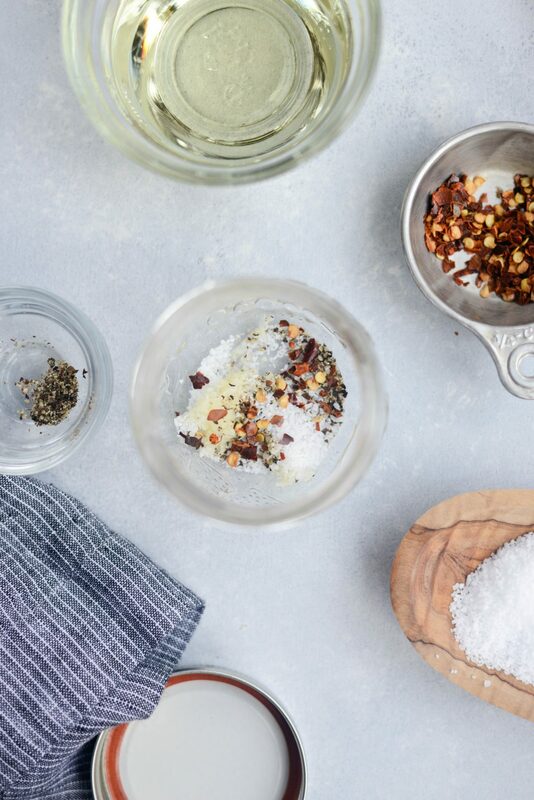 For a little kick, add a pinch or two of red pepper flakes. 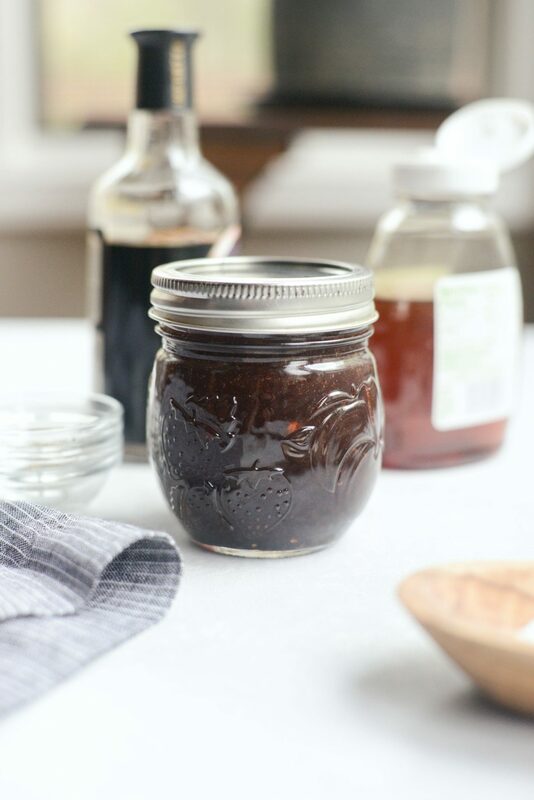 Then pour in 1/4 cup of the raspberry balsamic vinegar, 1 tablespoon of honey and 6 tablespoons of light olive oil. 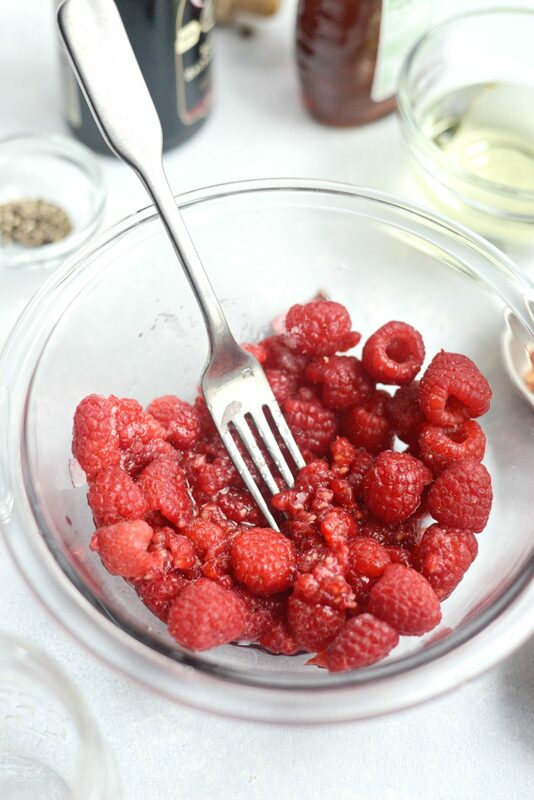 Add the raspberry juice into the jar (unlike me, make sure to use a large enough jar!). Screw on the lid and shake well to combine. 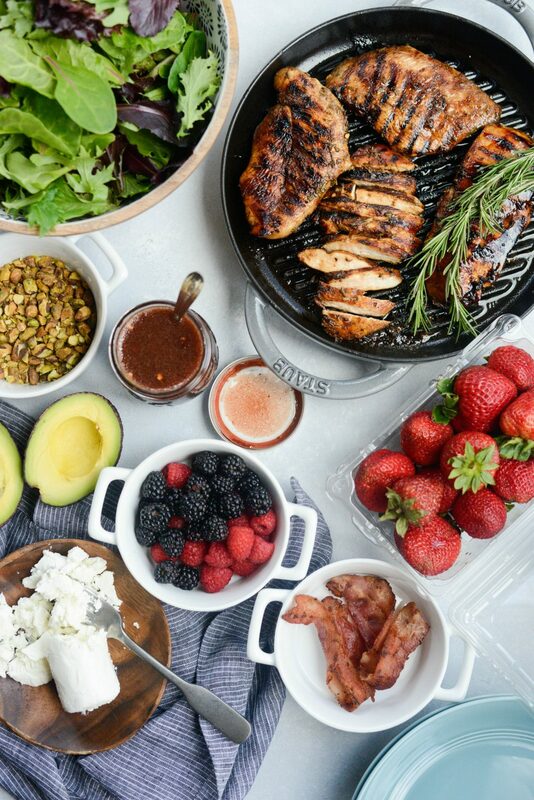 Arrange the spring greens, berries, avocado slices and grilled chicken (if using) in a bowl. Then scatter the chopped bacon, goat cheese and pistachios over top. 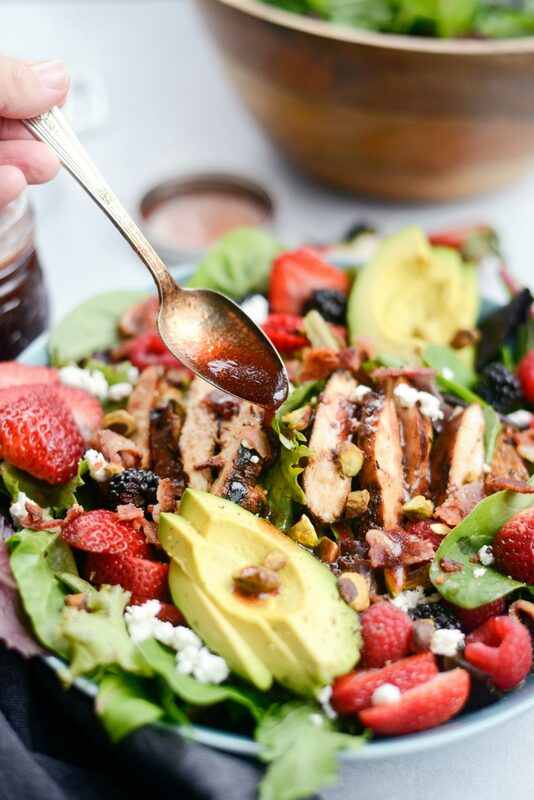 Lastly, drizzle a few spoonfuls of that ruby red raspberry balsamic vinaigrette over top of that beautiful berry spring salad. 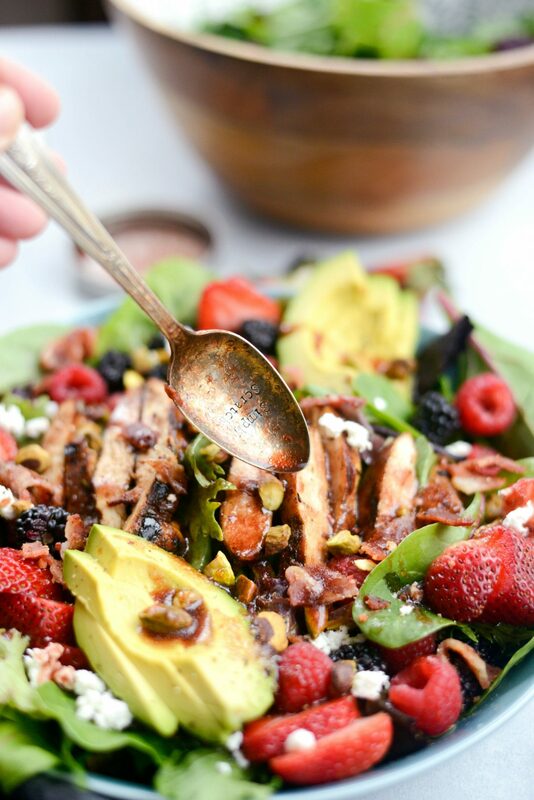 You’ll find bursts of freshness in every bite of this berry spring salad! 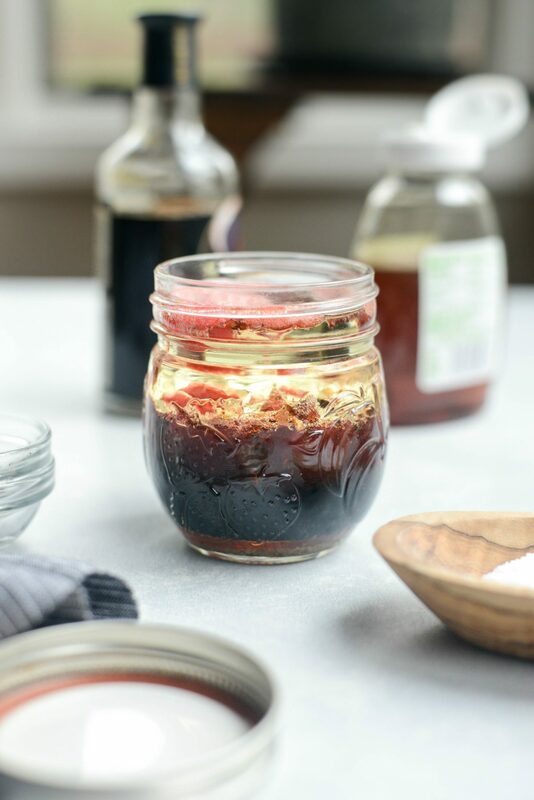 And the fresh raspberry balsamic vinaigrette will blow your mind. So simple and so perfect! Enjoy! 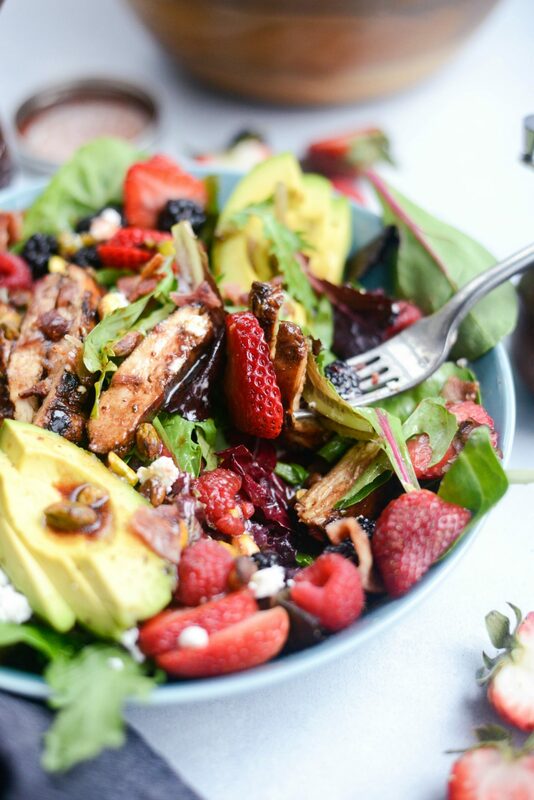 And if you give this Berry Spring Salad with Fresh Raspberry Vinaigrette recipe a try, let me know! Snap a photo and tag me on twitter or instagram! 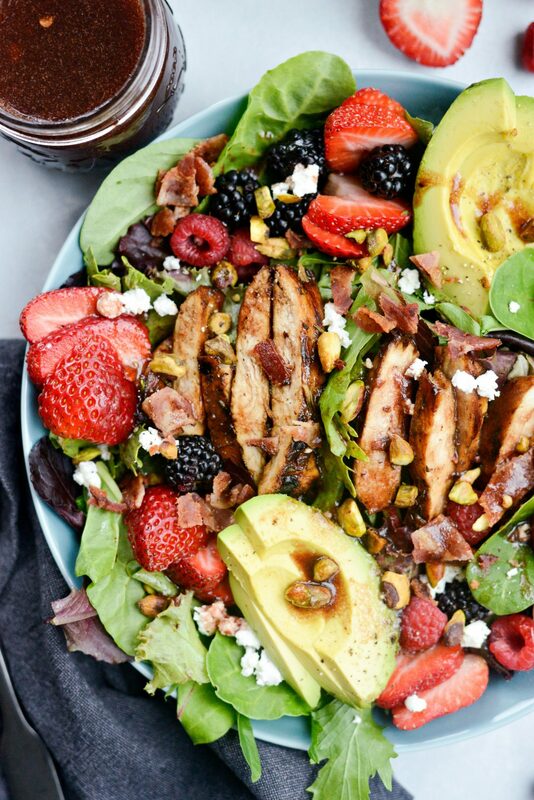 What has bacon, three kinds of berries and a REAL raspberry balsamic vinaigrette? 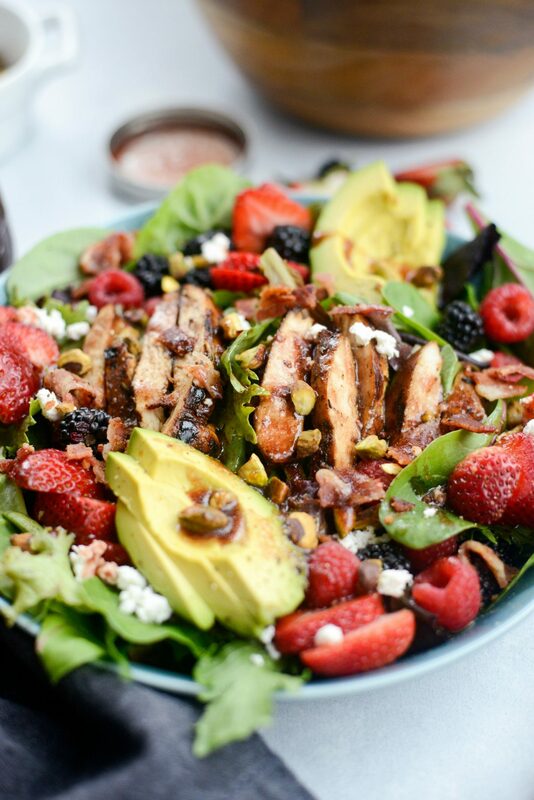 This fresh berry spring salad! 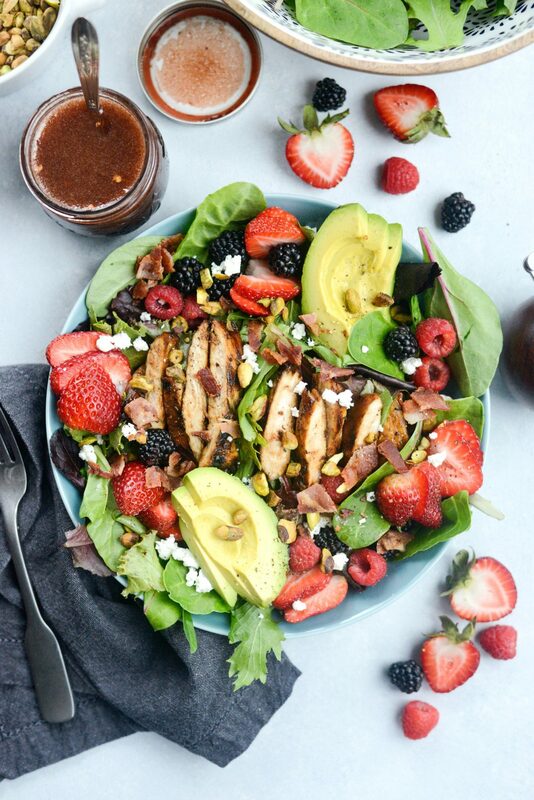 A mix of spring greens is topped with crispy bacon, sliced avocados, fresh strawberries, raspberries and blackberries, goat cheese, pistachios and the most amazing raspberry balsamic vinaigrette! 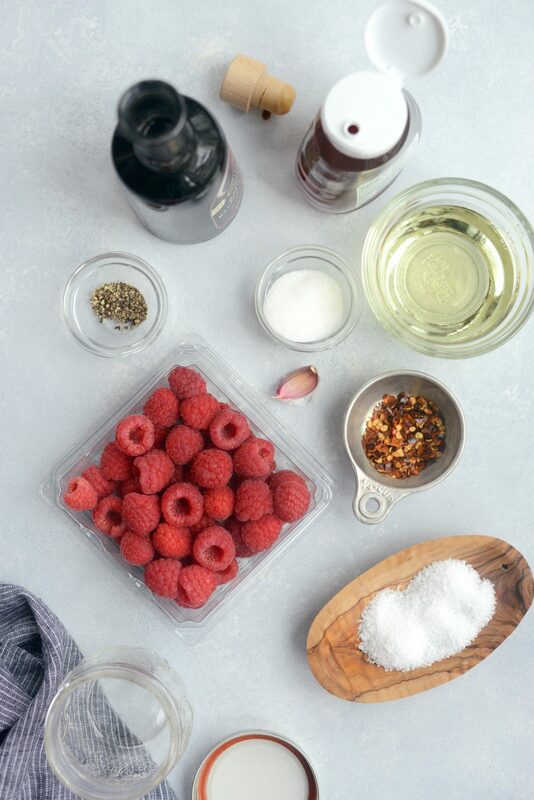 Place 6 ounces of raspberries into a bowl with 1 tablespoon of sugar. 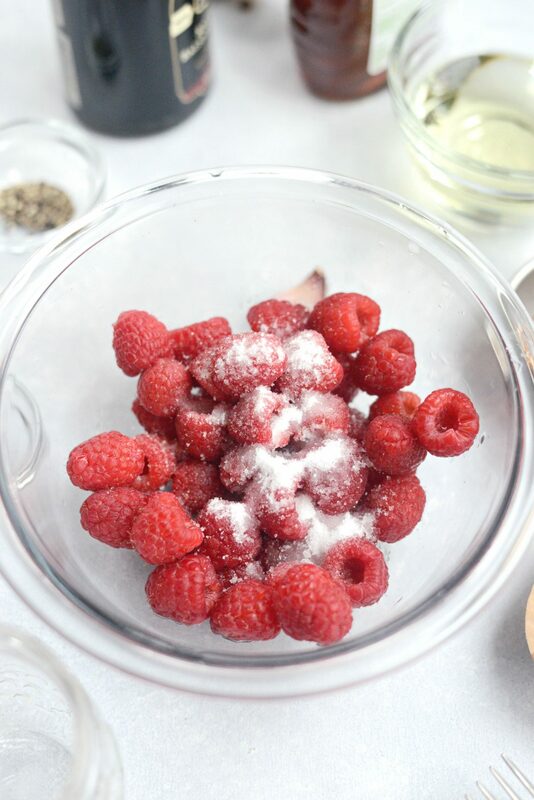 Use fork to combine and mashed the raspberries in with the sugar. Set aside. 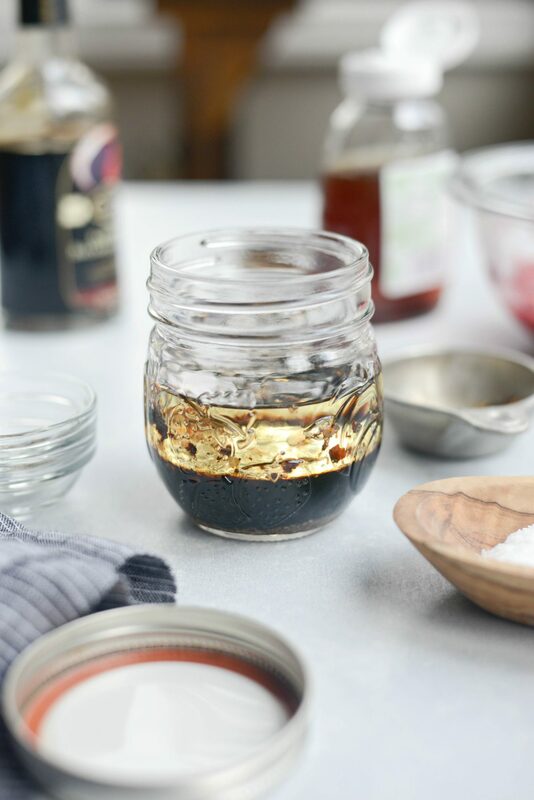 In a glass jar, add in the garlic, salt, pepper chili flakes, vinegar, honey and olive oil. 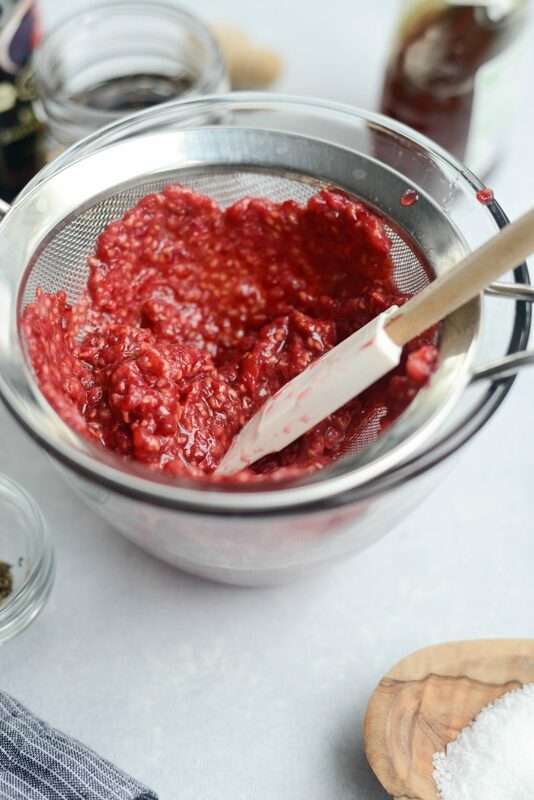 Next, strain the berries into mesh strainer that's set into a clean bowl. Use a rubber spatula to press the fruit through the mesh and collecting the juice in the bowl below. Discard the seeds and pour the juice into the jar. Secure the lid and shake well to combine. 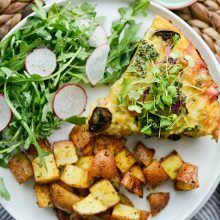 Arrange the spring mix into shallow bowls or salad plates. 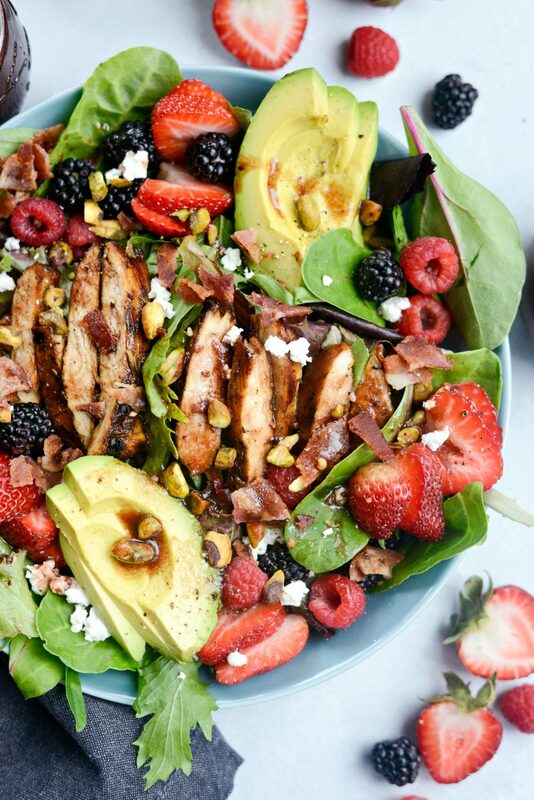 Top with grilled chicken (if using), slices of avocado, a combination of berries, crumbled goat cheese, chopped bacon, pistachios and drizzle with a few spoonfuls of the fresh raspberry vinaigrette. 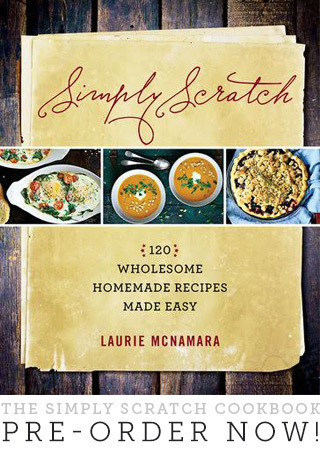 Let’s Celebrate Fair Trade Month with a Giveaway! Fixed! It looks like the link was to the actual home page. Thanks for the heads up, Alison!